About Southwood Stadium Southwood Stadium is massive. It is hard to comprehend how big the actual area of the ground really is, but despite having a huge playing surface, with a wide perimeter of grass around, there is still undeveloped areas on each side. It is a basic stadium. The clubhouse and changing rooms are actually outside the ground in the car park, and it is quite bizarre to see the players lining up in the car park (albeit behind fences) waiting to enter the action. The ground is relatively basis. Two covered terraces at each end and a small main stand with benches instead of seats. The far side of the ground is open. It is rather piecemeal with a portakabin perched in the corner of the ground as the boardroom, and one on the other side that acts as the club shop. How to get to Southwood Stadium The full address for SatNav’s is Southwood Stadium, Prices Avenue, Ramsgate CT11 0AN Approach Ramsgate from the west via A299 (Canterbury/London) or A256 (Dover/Folkestone) to Lord of Manor roundabout. Follow the signpost to Ramsgate along Canterbury Road East, counting via 2nd exit of the 1st roundabout. At the 2nd roundabout, continues towards Ramsgate on London Road (2nd exit). Take the 3rd turning on the left, into St Mildred’s Avenue, then 1st left into Queen Bertha Road. After the right hand bend, take left into Southwood Road, and 1st left into Prices Ave. The stadium is at the end of Prices Avenue. There is amble free parking at the ground or on the surrounding streets. The nearest railway station is Ramsgate, which is probably 10-15 minutes walk away. When you come out of the station turn right, and walk along Wilfred Road (past the sorting office) and straight on at the traffic lights at the junction with St Lawrence Park Road into Grange Road. Follow Grange Road until you get to shopping centre and at Zebra crossing turn right into Southwood Road. Go up Southwood road, following road round to right at the top, then turn 1st left into Prices Avenue. Admission for Southwood Stadium It is £8 for Adults this season, £5 for concessions, £2.50 for 12 to 16 year olds and free for under 12’s. A seat in the “main” stand is an extra 50p. Programmes are available inside for £2. Our last visit – April 2011 I cannot recall the moment the idea came into our collective brains, but I am sure it was well past our bed time and would have almost certainly involved significant amounts of ale. But whenever and whoever had the idea, it was genius. One day of football completely decided by the roll of a single dice. Our destination, our mode of transport, what we drink, what we eat and who we talk to. Simple really. In fact surely the basis for a global best seller and a film? No? What do you mean someone has already done this? Gits. Anyway in the run up to the big day we drew up a list of 36 potential games, split into 6 regions. The idea being we would roll the first dice on the day before the games thus giving us our area to head for. All was going well and through the means of modern technology we hooked up across the North Sea via Skype to do the live draw. Littlest Fuller rolled the dice and up came a Five. Five meant South West. Not ideal for me or Danny really. But that is fate. Littlest Fuller rolled again. Three. Walton Casuals versus Leatherhead. Both of us had been to Walton Casuals before so it didn’t really excite us. I could tell Danny was keen to follow Lewes on the long trip along the coast to Dorchester Town so we compromised. (Leatherhead ended up winning the game 6-0 by the way). “Throw a double and we go our separate ways” I proposed, and Littlest Fuller then proceeded to throw a double six. So on Saturday morning, with Danny heading westwards with the Rooks to Dorchester I picked up the small white cube and rolled it again. Number one – Kent. Probably the second best region for me. 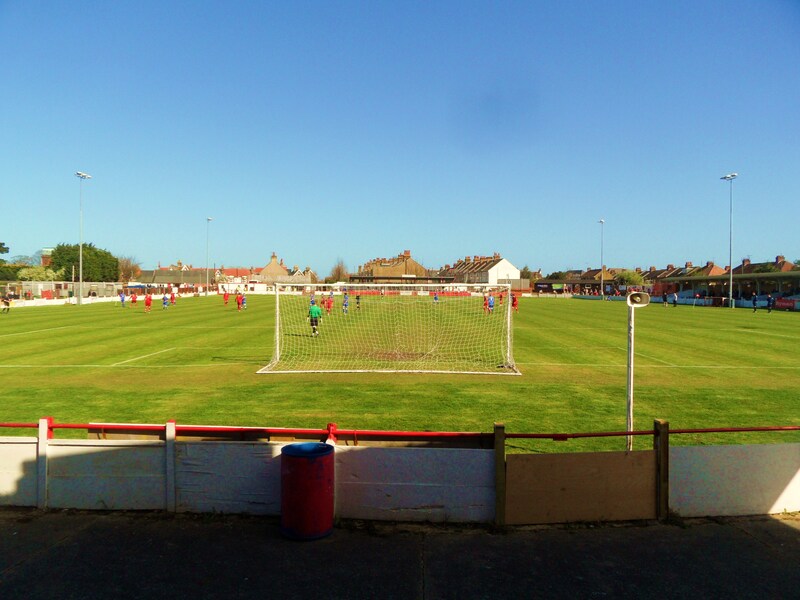 Roll again for the game Number three – Ramsgate versus Whitehawk, Ryman League One South. I’d never been to Ramsgate for anything apart from catching a ferry and using the ridiculously named London Manston International Airport (it is only 69 miles from London after all). Whitehawk are the Ryman League’s equivalent of Crawley Town to an extent. The owners have invested significantly in the side that last season were playing in the Sussex Senior League, and next season could well be playing local derbies against Lewes. Oh, and to underlined their “aspirations” they are moving into Brighton & Hove Albion’s Withdean Stadium next season as well. With the sun beating down on South East London, CMF suggested that her and Lolly tag along so they could go to the beach (just in case someone from Social Services is reading, Littlest Fuller was not home alone but at a friend’s house). Odds they came, evens they stayed at home. Number one – they were coming. Only fair to roll again to determine who drove then. Four – haha – a small victory for the male side of the Fuller family. An hour later we were parking up on the sea front in Herne Bay. I had already clocked the fact that Herne Bay were at home to Sporting Bengal at 3pm, but the dice had already spoken. But first it was time for lunch. Number one – Fish and Chips, obviously as we were by the sea, but what would I have? For some “interest” I let Lolly pick six items and she did well to pick three things I cannot stand. Fortunately, number four, Chicken & Mushroom pie came up trumps. I left the girls to their own devices as I headed down the Thanet Way, passing the Halfway House, made famous in the classic Only Fools and Horses Jolly Boys Outing. As a sign of the times, the once massive “bikers” pub is today luxury flats. 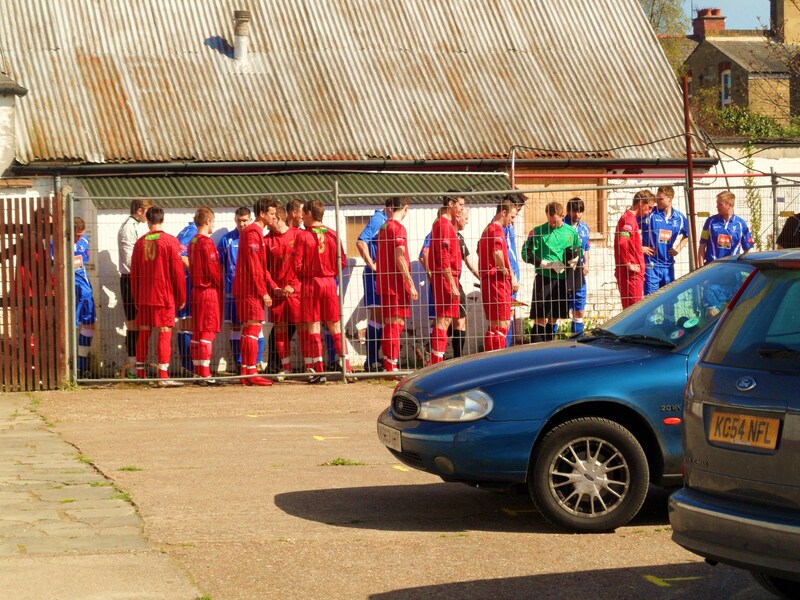 I pulled up outside Southwood, home of Ramsgate FC just as the players were lining up in the car park. Yep, that is right. The “tunnel” at Ramsgate is actually outside the stadium and they walk down a fenced path into the ground. Ramsgate 2 Whitehawk 2 – Southwood Road – Saturday 9th April 2011 Whitehawk came into the game in 3rd place, and with the promotion fight at the top featuring the Sussex side, Met Police and Bognor Regis Town looking like it was going to go to the wire this was a must win game for them. And they started like they meant business, peppering the Ramsgate goal from the first minute. In fact with just ten minutes on the board the corner count was already at 6-0 in favour of the away team. Ramsgate’s keeper these days is Jack Smelt. The name ring any bells? Well it would do if you grew up in or around Gravesend in the early 1980’s. His father, Lee who is now on the coaching staff at Arsenal played in goal for Gravesend & Northfleet. One day Brian Clough brought his European Cup winning squad down to Stonebridge Road for a mid-season friendly to mark the switching on of the new floodlights . So impressed was Clough of young Smelt that he came back the following season and signed him. Anyway, back to the action. Despite all of the early pressure it was actually the home side who took the lead in the fifteenth minute. From their first corner, Mark Lovell latched onto the ball and put it through Whitehawk’s keeper, Lloyd Anderson’s legs. This was literally the first time they had the ball in the Whitehawk area. Smelt was having a blinder in the Ramsgate goal. Twice he denied the Whitehawk strikers with excellent reaction saves but he could do little about the equaliser in the 27th minute when Lian Quinn inadvertently turned the ball into his own net from a Whitehawk corner. Two minutes later he was at the heart of the action again when he was adjudged to have picked up a back pass from a defender, despite it being from two yards away and almost on his goal line. We’ve seen the situation a number of times. An indirect free kick 7 or 8 yards out. Every player of the defending team is lined up on the goal line. Yet how often do the attacking team score? Very very rarely. But to me it is so simple. The free kick is indirect correct? Which means it has to touch another player before it can enter the goal (few people also realise that a free kick from an offside position is also indirect). So why not simply hit it as hard as you can at the wall rather than fannying about with a lay back. I reckon you have greater than 75% of actually getting a deflection and scoring. Of course in this case it was blocked on the line. Ramsgate had the last laugh of the half when Lovell broke clear down the wing and crossed for Stuart Vahid to sneak between the two centre backs and slot home. It was crunch time. Time to let the dice decide should I stay or should I go. Evens to stay, odds to go. Number five rolls face up. So where could it be then? One/two = Deal Town (v Erith Town), three/four = Whitstable Town (v Chatham Town), five/six = Herne Bay…..And it is a six. Back to the car and off we go again. Photos from the game at Ramsgate can be found here. (The game finished 2-2 with Whitehawk scoring late on). Herne Bay 2 Sporting Bengal 0 – The SafetyNet Stadium – Saturday 9th April 2011 Thankfully there were no Sunday drivers around and 17 minutes after leaving Southwood I was walking through the open game at Winch Field, home of Herne Bay. The second half here hadn’t yet started fortunately so I had time to go and grab a beer. With six different beers on offer there was only one way to choose my tipple – and number three saw me enjoying a rather nice drop of Courage best. The Sporting Bengal set-up is unusual in that it is operated by the Bangladesh Football Association in the UK and players are selected from (and retain their affiliation with) the Sunday league clubs which are affiliated to that organisation. In the 2008–09 season, Sporting Bengal lost all 32 matches to become the first team in the Kent League’s history to complete a season without achieving a single point. An impressive feat by any side. I took my place next to the away team dug out. Or should I say conservatory. This was the most bizarre set up I had seen. The dressing rooms were essentially a large blue “hanger” on the side of the pitch, with conservatories built in the front to act as dugouts. Sporting Bengal’s coach jumped from his seat, not to remonstrate with the ref but to have a fag. One of the scrapbook – not since the days of Cesar Menotti have I seen a manager smoking in the dugout. The game should have been a foregone conclusion. Herne Bay were sitting pretty in second place, within touching distance of FA Cup heroes Hythe Town, whilst the visitors from East London (and not Kent) were propping up the league in last place. Despite their early pressure in the second half it appeared that it wasn’t going to be Herne Bay’s day. Then I did a count of the players. The home side only had ten men. What to do in these instances? Well I asked the lino of course. Bless him. He was possibly the oldest linesman I have ever seen. But in breaks of play he updated me on the red card for a professional foul by Herne Bay’s Steve Hanson and the “wonderful” opening goal by Jimmy Corbett. They doubled the lead just after the hour mark when Toby Ashmore poked home after a corner wasn’t cleared and should have got a third when they were awarded a (harsh looking) penalty in the seventy fifth minute but it was put wide. Full time came and it was time to go. I picked up the female Fullers and we had one last roll of the dice to go. What to have for dinner? A three saw us heading for the Harvester and me paying. Who says I had the luck of the dice today? Photos from the game at Herne Bay can be found here.